There are slew of tablets, then there is iPad. Note the underline! 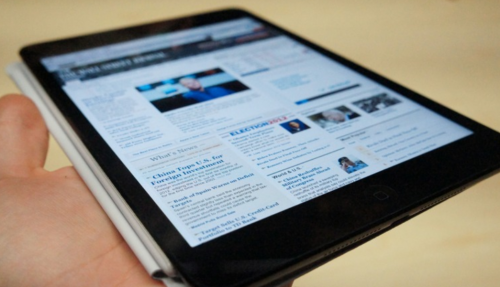 World is witness to the success of iPad which successfully marked a new score by selling over 100 million units. Read again, it’s 100 million. Those 100 million users of iPad are not just because they love Apple products but because iPad has something exclusive to offer that none of the competitors have been able to, till date. 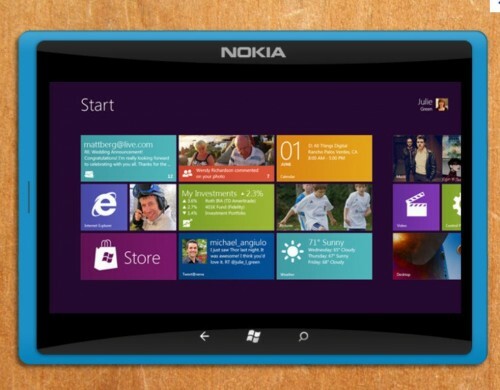 We don’t know how the market game and statistics will be affected once windows 8 tablet convertibles catch fancy of users worldwide (we anticipate game changing arena with upcoming windows 8 based tablets). On account of its vast success with iPad, Apple wants to bank profits on all sort of prospective variations, and so taking notes from Google Nexus 7’s success and growing demands for 7 inch tablets, Apple has now officially launched iPad Mini, a 7.9 inch tablet (put the digits in reverse i.e. 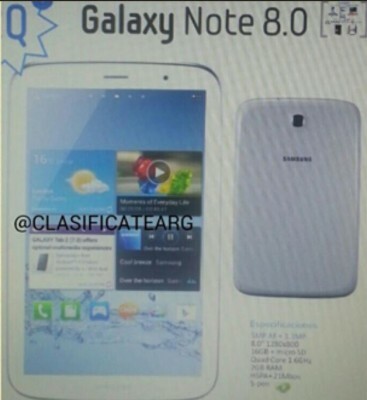 9.7 which is of the elder iPad), about which leaks and rumors earlier have already created the roar and buzz enough to make the announcement obviously predictable. For Apple to enter mini tablet market, its not too late (Also, we’ve not heard of any windows tablet in 7-inch tablet space). 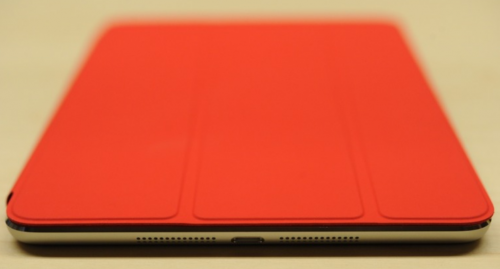 So, lets dive into details of the new iPad Mini. Speaking of design features, iPad Mini gets the same respect as its elder sibling iPad, clad with aluminum and glass exterior giving you homely premium feel as you’d expect from any Apple devices. 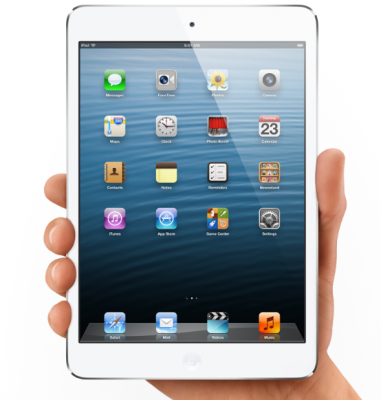 iPad Mini weighs almost half of the iPad i.e 0.68 pound (308 gram) and is thin by quarter percent i.e. 7.2 mm. This may not fit in your pocket unless you’ve quaint larger cargo pocket but can suitably clutch in your hand without the need of other hand, not if you’ve small hands. There is volume rocker, mute/orientation button as usual. The speakers are at the bottom, so basically, you’re getting a diminished in size and weight iPad with familiar design. (We know Apple can’t mess up the so-called unique design preference they’ve adapted to). Internal specification of iPad Mini is not something of breakthrough vouch, rather may seem disappointment for some of the eager expectant. 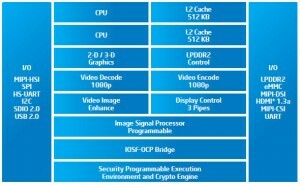 Screeching its tire on dual-core A5 processor chip, iPad mini promises to cover miles of run without break, but not fast enough to race against its edgy current generation iPad(4th generation iPad is running A6X processor which is twice faster in cpu and graphics performance compared to A5X chip). Furthermore, the screen resolution is nothing sort of retina display, instead it is 1024*768 pixels with density of 163 ppi, the same as found in first generation iPad and iPad 2. The screen resolution if iPad Mini is lower than that of the competition. Taking camera into picture, iPad Mini does fair justice by bringing 5 megapixel iSight camera on board at rear with Apple’s advanced optics tech inside working to help you take nice pictures and record video at Full HD quality i.e. 1080p. At the front, we’ve FaceTime HD Camera. Both these camera features backside illumination to compensate for lowlight photography. Dual-band wifi support for fetching speed of upto 150 mbps make this tablet competent enough to utilize sharp share of bandwith of your wifi network. There is also personal HotSpot feature inbuilt to allow you to share cellular data over wifi, bluetooth with other compatible devices. Not to mention, iPad Mini incorporates the new Lightning connector support which has been introduced in iPhone 5 and 4th generation iPad also. You can connect sd cards, hdmi, or other devices using several iPad Mini accessories with lightning connector. 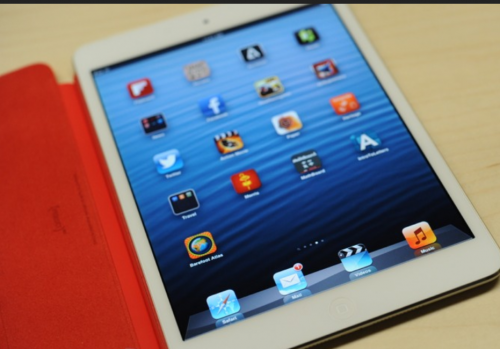 iPad Mini runs on the latest iOS 6 and so you can access all those awesome iOS apps (over 750,00 and more than 250,000 designed for iPad – yeah, we know that you are not going to cross even 500 apps usage). iPad Mini is likely to be used as e-book reader and for that purpose, we’ve access iBooks store which contains over 1.5 million books. Moreover, iBooks app and iBooks author app has been updated just in time to boost the iPad Mini use as e-reader. $329 USD for the 16GB iPad Mini wifi only variant. and $529 (US) for the 64GB variant. and $659 (US) for the 64GB model. Pre-order for iPad Mini starts from October 26, 2012 and will be available in retail stores from November 2, 2012. iPad Mini is available in just two color variants i.e. mix of black and slate, white and silver. Although, You can accessorize iPad Mini with a new polyurathene smart covers available in several colors as pink, green, blue, light gray, dark gray and red for price of $39 USD. 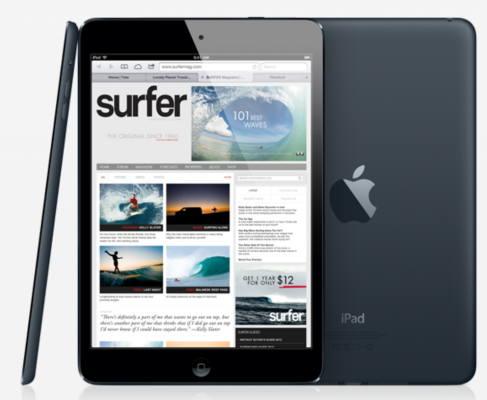 The release date of iPad Mini in India is confirmed and will be available for sale starting December, 2012. 64 GB at Rs. 32,900.
iPad Mini WiFi + 3G model in India is priced at Rs.29900, Rs.35900, Rs.41900 respectively for 16Gb, 32 and 64GB models.